Have you ever met a hands model? If so, she was probably wearing elbow-length gloves around the clock as part of her beauty regime. Totally understandable considering those hands and nails are her money-makers. 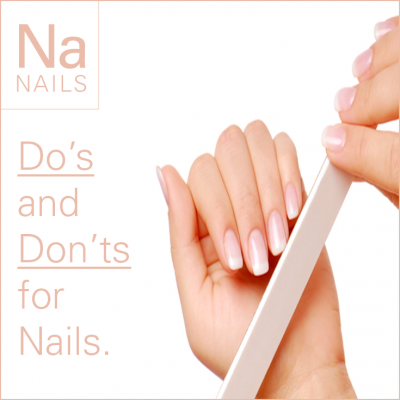 Nail care can be as simple or as complex as you want it to be. I don’t recommend wearing elbow-length gloves, but in addition to these nail-nourishing nutrients, a few good habits can go a long way. 1. Do wear rubber gloves whenever cleaning or doing dishes. Not only will this save the skin on your hands, it will make a huge difference with your nails. Chemicals in dishwashing soap and other cleaning agents are harsh, and contribute to the break down of your nails. Keep a pair of rubber gloves handy at your kitchen sink and near any other chemicals you use to clean. 2. Don’t pick at hangnails. Hangnails are painful, annoying and unattractive. The worst thing you can do, however, is pull at them. It’s easy to pull live flesh along with the dead skin. This causes redness, irritation and occasionally infection. Instead, use a clipper to gently remove just the dead skin. Take the time to remove the hangnail before it has the opportunity to snag on a piece of clothing and rip live skin from your nail. 3. Do use a nail file. Rough emery boards can cause tiny cracks and fissures in the nail bed, but a smooth, fine file can help shape the nail in a way that will help prevent breakage. Use the file in one direction only, rather than sawing back and forth (the back and forth motion can cause cracks that will lead to tears and breakage). Square shapes tend to be stronger, but you are more likely to use your nail as a tool, which usually means a broken nail. Filing your nail into a rounded shape isn’t as strong, but may keep you from breaking your nails when trying to open a package! 4. Don’t remove cuticles. Many professional manicures include cuticle removal. This is a big no-no! You may notice an increase in painful hangnails after cuticle removal. Instead, use a cuticle moisturizer and gently push cuticles back with a cuticle tool (without forcing). Your cuticle provides protection against fungus and bacteria. By removing your cuticle you are opening yourself up to infection and permanent nail damage. 5. Do moisturize. This is a critical part of nail care, particularly if you are washing your hands several times a day. Anytime you come in contact with soap, sunshine, dry air, or life in general, your nails are drying out. Add a hand cream to your hands after each wash or whenever your hands feel dry. After adding the cream, take the time to massage some into the beds of your nails, paying attention to your cuticles. 6. Don’t bite. This seems obvious, but it can be a very difficult habit to break. If you are a nail biter, work towards becoming conscious of each time your hand approaches your mouth. Rewarding yourself at the end of the day for not biting your nails or promising yourself a beautiful manicure after a week of not biting can be a powerful motivator. As you bite your nails, you shorten the entire length of a nail bed, making your nails appear smaller and smaller as time goes on. Give yourself a gift and learn to stop the biting. 7. Do go natural. It’s okay to splurge occasionally with a manicure, but your natural nails are gorgeous! Leaving polish off your nails allows them to breathe. If you do decide to get a (or do your own) manicure, make good choices. Use a good base coat and top coat, avoid nail polish removers with acetone, and don’t pick at your polish once it’s on (which can also weaken your nail). Allow your nail time to recover between manicures, and continue to moisturize both your nails and cuticles. Before long, you will have longer and stronger nails. In addition to these steps, take an inside out approach and make over your meals with these six nail-nourishing nutrients.